Out from under the bubble wrap it came, sliding into view like a hornworm from under a tomato leaf. The slither-POP sounds of its passage made the pit of my stomach churn, bringing to mind images of an army of snakes which had recently eaten Mentos and Diet Coke emerging from the grass of a suburban garden. First, a glimpse of translucent brown bottle, hard and curved like the back of some translucent scarab beetle; then the edge of pink and coral which was the label, on which the glyphs which proclaimed its identity had been scrawled. Third in the mystery pack of flavors sent by Mike and Esteban at Oogave, we have Grapefruit. I'm familiar only with a few other grapefruit sodas; Squirt is a nice change from the usual colas now and then, and Hansen's Grapefruit is similar. I'm looking forward to this. Where and when: sent in September 2009 by Oogave. Color: clear, with itty-bitty bits of something floating in it. I'm presuming that's grapefruit. I'm really hoping that's grapefruit. Scent: Not much scent at all. Very faint citrus. Me: "Do you smell anything in this?" She says you feel it more than smell it, and that it is sharp and citrusy. Taste: The initial taste is sweet and very smooth, with almost no citrus. This then fades in an interesting way over the next three or four seconds, and a mild grapefruit flavor comes out underneath. It's a bit like honey on a grapefruit. The aftertaste is very clean--no lingering anything. No, wait. There's a little bit of mild citrus still there. 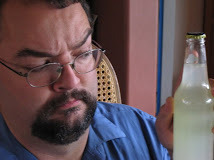 The soda itself is very mild, mellow, with an interesting bit of tart/bitter grapefruit. As it warms up, the grapefruit is becoming more evident in the initial taste, but not in a bad way. This is a very light, mild soda, not a strong citrus at all. Mellow. Might actually be thirst-quenching. And, according to the nutrition facts, it has a tiny bit of fiber. Heh. Quite pleasant. It's not often that I almost wish that a soda were stronger, and don't exactly on this one--if I were going to suggest an improvement, though, that's what might occur to me. WHAT THE &$@%# IS THIS $@#%? ALL THIS HAPPY "OOH, IT'S ALL NICE AND LIGHT AND SPARKLY. MY FOOFY NAMBY-PAMBY TASTE BUDS ARE FROLICKING WITH DELIGHT. FAIRIES ARE $@@#%ING COMING UP FROM MY ! @$#ING THROAT AND DANCING THE MACARENA ON MY UVULA*! COME ON, A SODA SHOULD GRAB YOU BY THE PALATE AND YELL "I'M A %#$$@ING WEIRD SODA, YOU #$%*&ING WUSS! ENJOY ME! EEEENNJJOOOOOOOOYYYY MEEEEEE!" Well, I enjoyed it, anyway. Quaff rating: 3.5. Very nice, light. And I'm not ashamed of that. Cough rating: 0. No impulse at all to expel it. *I don't actually have a uvula. Seriously. Could you taste or notice the floating particles while drinking? No, they were very small, and I didn't notice them. Where did your uvula go?! I have been reading these backwards, and I am pretty sure this was the last time you ever reviewed a soda that had a 0 cough rating. So far. I had my uvula removed as part of a surgery to stop sleep apnea. Haven't missed it.